Many economic data points have been tapping the brakes recently indicating slower economic activity. 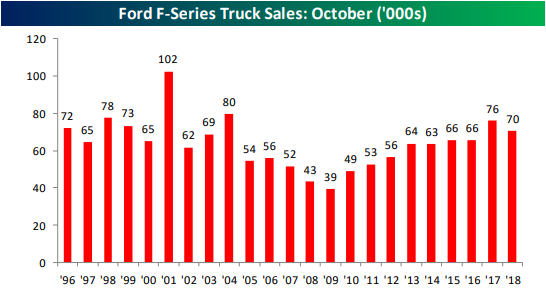 One data point that we like to look at is Ford (NYSE:F) truck sales. Trucks are typically purchased by small businesses and contractors, so they provide a good read on the health of the small business sector. Based on these sales totals for October, small businesses took a little bit of a step back. Last month, sales of Ford F-series trucks totaled 70,438, which was down over 7% from last October’s total of 75,974. Although one caveat to this decline is that in 2017 sales totals were boosted by repurchases of vehicles flooded in the hurricanes making for a tough y/y comparison. Outside of 2017, this October’s sales were the highest since 2004, which also lends some credence to that argument even if this year did have an extra day of selling compared to last October (26 vs. 25). 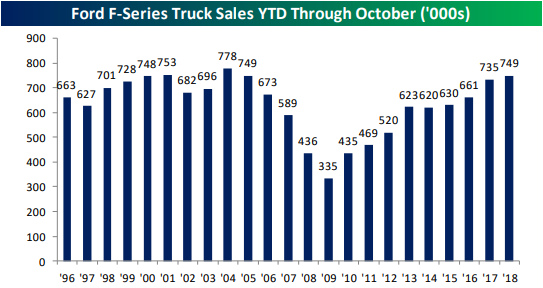 On a YTD basis, sales of F-Series trucks have totaled 749.5K, which is still up slightly from last year’s pace and is the strongest YTD reading through the first ten months of the year since 2004.